Heat the butter in a pan and sweat the shallots and fennel until soft. Add the wine and sherry and reduce by half. Add the stock and bubble away again until reduced by half. Pour in the cream and boil until reduced to a sauce like consistency. Strain through a sieve, discarding the shallot and fennel. Stir in the mustard, check for seasoning then leave to cool. Meanwhile heat the oven to 180°C. Check the fish for any small bones, removing any with tweezers, then cut into 3cm chunks. Poach the fish in enough water to cover, with a squeeze of lemon juice and the thyme, until slightly undercooked. Remove the fish from the poaching liquid with. Gently fold the fish into the sauce with a little extra lemon juice. Transfer to an ovenproof baking dish. Cook the potatoes in boiling salted water until tender, and mash with a little milk and butter until smooth. 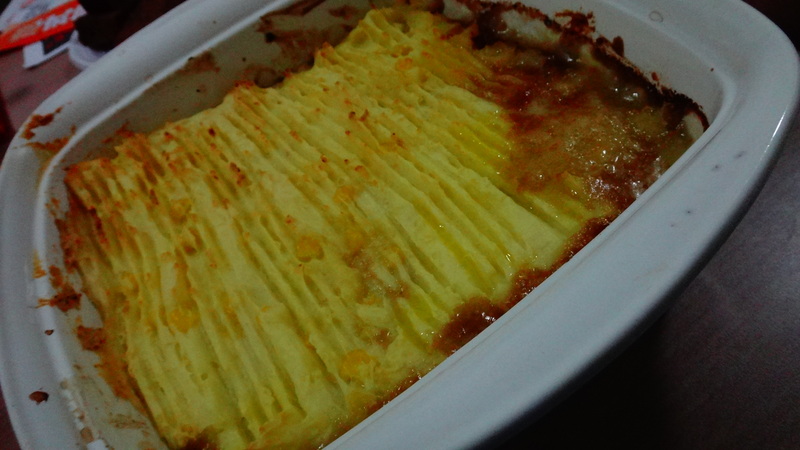 Then spoon the mash over the filling for a more rustic finish. Bake the pie for about 20 minutes until bubbling and golden brown on top. Will HE make it again?